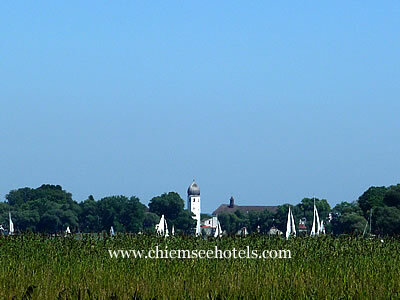 The Fraueninsel - sometimes called Frauenchiemsee - is the second of the three islands on the Chiemsee. It measures only 600m x 300m and is home to a population of around 300. The island is reached from Gstadt or the ferries originating from Prien via Herrenchiemsee and, in the summer months, there are additional services from Seebruck and Übersee. The island has a beautiful and atmospheric setting in the northwestern part of the lake and is to be highly recommended as part of a visit to the lake. In the 19th and early 20th centuries the attraction of the setting drew a number of artists to the island and encouraged the formation of a Fraueninsel artists' colony. 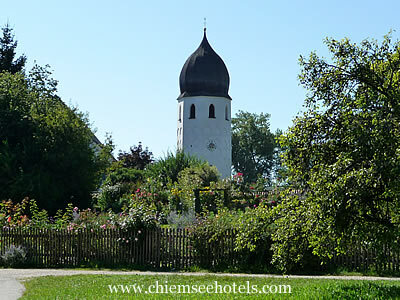 Its best-known attraction is the Benedictine convent of Frauenwörth - the bell tower of which can be see from far away across the lake waters. The Abbey itself was founded in the 8th century by Duke Tassilo III and the first abbess, Irmgard, is now venerated as the patron of the Chiemgau region. The convent, subsidised by an industrial concern, now provides seminar facilities as well as selling their own speciality products through a shop on the island and an online shop (which can be seen at: www.frauenwoerth.de). A wander around the island takes the visitor past the Carolingian gatehouse (one of the oldest buildings in southern Germany), the island cemetery (resting place of some of the artists), and a number of guesthouses and shops around the waterline, with an open grassy area at the centre of the small island shaded by lime trees.